The word "wolf" alone might be enough to give you an impression of steely determination and pure composure. Despite their tough reputation, however, wolves sometimes have to worry about predators, too. Red wolves (Canis rufus) are trim-bodied members of the family Canidae. Not only do they prey on many animals, they are sometimes the prey, too. 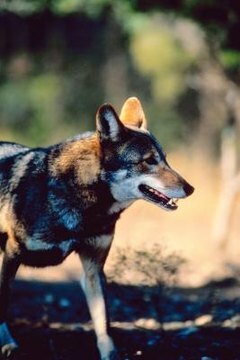 Although red wolves are close kin to gray wolves (Canis lupus), they are markedly smaller than the latter animals, with much narrower physiques. Female red wolves are just a tad smaller than the males -- by roughly 10 percent. Adult females generally weigh between 40 and 66 pounds, while adult males generally weigh 44 to 84 pounds. These wolves typically grow to between 4 and 5.5 feet in length. Their coats are mostly red, but with lots of black, gray and pale brown elements, too. They also possess lengthy limbs and sizable ears. Red wolves were classified as a "critically endangered" species by the 2008 assessment from the IUCN Red List organization. Throughout history, red wolves have often been seen by people as obstacles to the survival of birds and farm animals. Because of this, many farmers have killed them, in turn leading to their massive reduction in population. These wolves originally come from North America, and in the present day reside exclusively in North Carolina. Fellow species from the family Canidae are prominent risks to red wolves. Coyotes and gray wolves frequently partake in big battles with red wolves, generally over turf. It also isn't at all uncommon for red wolves to experience predation from individuals of their own species, albeit from different social units. As with many other types of animals, the juveniles are susceptible to bigger predators, including bobcats and substantial birds of prey. These mostly nocturnal creatures subsist on meat and mostly just that. They mostly go after hoofed mammals and rodents, although tiny mammals, across the board, are a staple for them. Some examples of typical meals for red wolves are pigs, fish, rabbits, rats, birds, reptiles, insects, raccoons, muskrats and nutria. They occasionally dine on deer. Choosiness regarding food is not their thing. The carcasses of decaying animals also serve as "once in a while" meals for red wolves. Although meat is undoubtedly their preference, they sometimes consume berries.